After a couple years of the federal government piling on new rules and regulations one after the other, our team at Quantus was thrilled to see a new innovate product come to the market last week. Innovative products are what makes the world go around in most industries, but the past few years in the mortgage industry we have just been dealing with the impacts of the new rules and guidelines. Now that the dust has settled and the mortgage industry has had time to adapt, new innovative options are starting to emerge. That’s why we’re excited to share a new mortgage product that’s quite appealing and may be a great tool for some clients. Through a partnership with one of our top lender partners, we’re happy to offer an interest only mortgage! Now, just to clarify, interest only mortgage products have been around for decades, but only in the form of a Home Equity Line of Credit (HELOC). This is different in that a traditional HELOC is set at a floating rate tied to the prime rate. Typically, right now a HELOC is offered at Prime plus ½% to 1%. 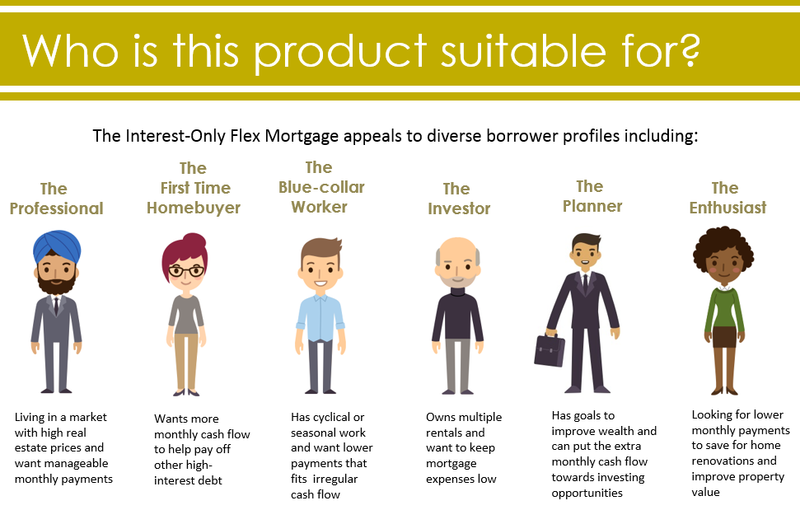 Our new interest only mortgage has a fixed interest rate option to it, just like a regular 5 year fixed mortgage you’re most familiar with. The difference is, rather than a principal and interest payment, you can choose for up to 65% of your home’s value to be paid as interest only. But why would someone want interest only payments? Isn’t the idea to pay off your house as soon as possible? Property investors that own rental properties and want to keep their expenses low. Clients that are carrying other high-interest debts and will use the extra cash to pay these down. Clients with cyclical or seasonal work who would like to pay down their mortgage using their 20% repayment feature on a schedule that fits their irregular cash flow. Consumers that have goals to improve wealth over the long-term and can put that extra cash to better use through investing opportunities, rather than using it to repay principal on a mortgage. Clients that seek greater control of their cashflow and aim for optimal management of their liquidity. People looking for lower monthly payments to save for home renovations and improve property value. Borrowers who like a variable type mortgage where the rate is lower than a HELOC, but want an interest only option. Paying interest only will make your monthly mortgage payment comparatively lower and give you choice and flexibility with your finances. For example, on a $350,000 mortgage over 25 years at an interest rate of 3.5% your interest only payment would be $1312 per month versus $1,747 per month for a principal and interest payment. That’s a savings of $435 per month, or over $26,000 over a 5-year term! There are many scenarios where this new option is an excellent tool to use we’d love to share. Like any financial transaction, choosing an interest only type mortgage requires some thought and questions asked. Using an experienced Mortgage Broker to provide professional advice is imperative to help you make you decision as to whether this type of financing is right for you.